Description: Step back in time with a traditional glass, fit and finish. Reminiscent of lighting fixtures from the early 1900s. 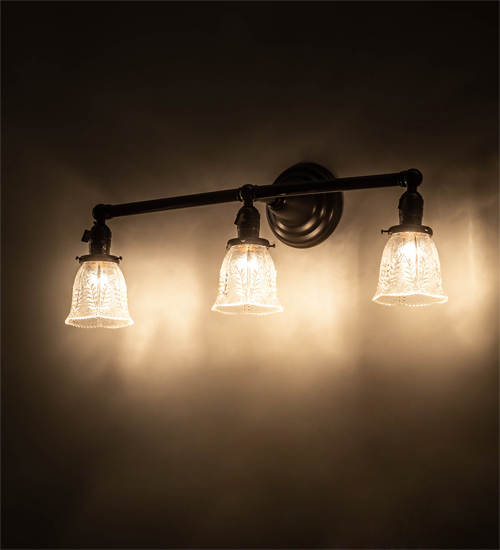 The Revival Summer Wheat Wall Sconce features three Clear Textured Revival glass shades that offer an authentic historic look to complement a vanity in a fine bath or any other room. The Solid Brass hardware and accents in a Craftsman Brown finish make this piece a timeless treasure. Handmade in our 180,000 square foot manufacturing facility in Yorkville, New York. Available in custom sizes, styles, and colors. Dimmable energy efficient lamping options offered. UL and cUL listed for dry and damp locations.